This costume was created by popular request to coordinate with my pebbles costume. 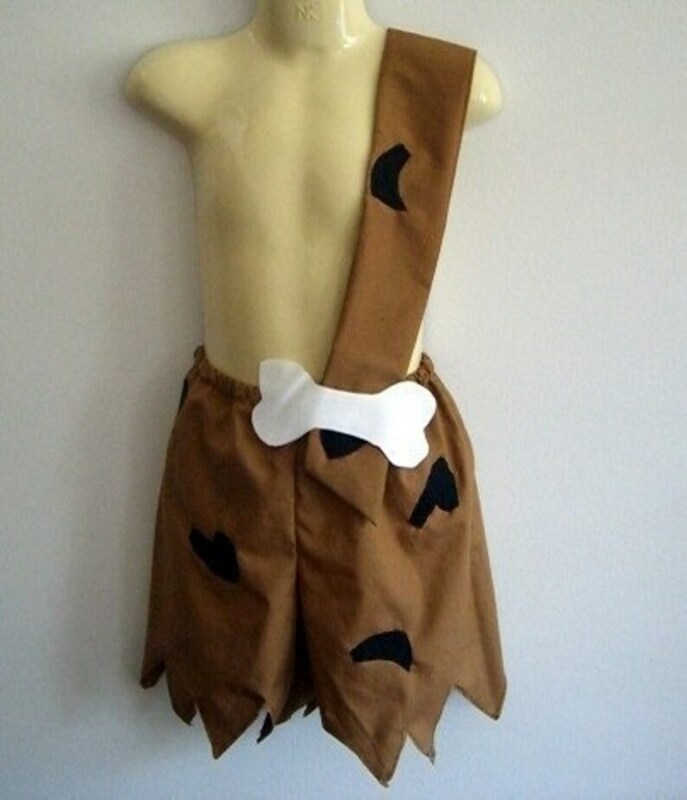 This costume is composed of bam bam's little shorts with unfinished hems to add to the caveman feel and strap both scattered with animals spots through out and topped with a felt bone pin making the strap adjustable. 12-18 months (chest 22" waist 20"
NO RETURNS EXCHANGES for costumes ordering in October. PLEASE READ MY SHOP ANNOUNCEMENT FOR SPECIAL ANNOUNCEMENTS, VACATION NOTIFICATIONS AND OTHER POSSIBLE CHANGES IN THE SHIPPING SCHEDULE. All my items come tied with a bow, if you would like to include a little gift note just let me know in the messages to sellers when you check out. I now have a ready to ship section which contains items that are already sewn up and ready to go. Obviously there is a much more limited range of sizes and designs, but you just might find something you love. Another option if you are pinched for time, unsure of size, or your friend's personal taste is giving a gift certificate. For information see the profile or gift certificate listing in the Ready to Ship section. Beautifully made. Perfect touch to my little girl’s ONEderland birthday party. I can’t thank you enough! The outfit was perfect for her first birthday photo shoot. The outfit came very quickly and it is amazing. As keeping with Etsy's policies, paypal payment is expected immediately following the order. You do not need a paypal account to pay with paypal (all you need is a credit card or debit card). If you have any special requests please ask me prior to ordering so I can make sure I can properly fill your order. If you are choosing to pay with check please understand that I will not start creating your order until your check has cleared. Obviously this could drastically increase your wait. Please do not purchase an item if you do not intend to pay for it or might change your mind. If you wish to cancel your order after payment is received, through no fault of mine, but your failure to read the listings/announcement/policies, there will be a $5 per item cancellation fee deducted from your payment refund. Please only ask to cancel refunds within a few days of placing orders. It is very rude and frustrating to have someone ask to cancel an order after I have spent my time fulfilling their order and using up my supplies to make it with their size, color, etc. specifications in mind. I will accept returns for store credit or exchange only. Due to the handmade nature of my items I do not do refunds. In order to be eligible for an return the item must arrive in new condition and be post marked within 7 days of the delivery confirmation date. Please contact me as soon as you receive the item to arrange a return. Store credit will be given for the cost of the items (not shipping costs). All Halloween orders are final. I sell out of costumes every year so unfortunately I cannot accept any returns for costume orders made from Oct. 10-31st. Please note I cannot guarantee that if you want to return/exchange a costume item during my Halloween rush (the beginning of September through October) I will be able to get you another costume in time. So please order early to make sure everything works, otherwise you can use your store credit on other non-Halloween items in my shop. Costumes sent outside of my return time period will be donated to a local women and children's shelter. If you have found a design flaw or other issue with your item please let me know within a week of delivery (I ship all domestic items with delivery confirmation) so I can make things right. All international custom fees are to be payed by the customer. Unfortunately I cannot replace or issue refunds for any international orders that are lost or not delivered. I can provide a receipt of shipping via email but since I am unfamiliar with the postal services of other countries I cannot be held responsible for their mistakes. If you would like to insure your order please let me know and I'll be happy to invoice you for the cost of the insurance. Most of my items unless otherwise stated require 2-3 weeks to be created BEFORE shipping. All domestic orders will be shipped with delivery confirmation through paypal. You should plan on your order taking the FULL turnaround time. Obviously I can't start making items unless I know what size to make them so the turnaround time starts when I receive payment, size and any other information I need to start the order. I try my best to catch if someone forgets include size/color info but I am very busy with all the other aspects of the business so sometimes it takes me until I'm ready to start the item to notice. If you need anything faster please send me a note BEFORE placing your order to see if I can do a rush order to make your special date. Also remember that I do have a Ready to Ship section for last minute buying. I recommend ordering as early as possible regardless of the time of year but especially during my Halloween season. Please note that my busiest time is from September to Halloween. If you hope to order costumes during this time please see the individual listings for the time frame (they often take longer than 3 weeks because my orders increase sometimes 300% of my normal load during the rest of the year). At times I offer to rush orders for a fee. The majority of the rush fee covers bumping the order ahead of orders that have already place (basically getting it to the post office it faster than the 3 weeks BEFORE shipping turnaround time). A small portion goes to upgrading the shipping. I have no control after I drop it off so the rush covers me sending it on the agreed upon date with the agreed upon mode of post. In the unsual case that the post office does something weird I cannot be held responsible. THere will be no refund given for the rush since I will have already rearranged my schedule to get the order out and since the post office will not refund the cost of shipping. If you change your order after it is placed (size, color, anything) expect delays. It gets VERY confusing to manage. I may have to charge for changing the order and I do charge a cancellation fee (see below) so it is best to make sure your are certain about your order when placing it. Changes (even small ones) take extra time and effort to keep the old and new and correct information straight. Please take the time to read the listing so you can properly judge what size to order BEFORE placing your order. After one too many bad experiences I no longer accept wholesale orders. Please do not sell my items without prior written permission. Most of my items come in sizes 0-3 months all the way up to 3T. Some of my dresses (like the Fancy Nancy dress) come in larger sizes. If you are only seeing a few ready to ship sizes please read the above paragraph. If you like something but need a bigger size I would love to help you. With a few measurements I can make larger items via special order and I have standard measurements up to size 7 (but I prefer to work from measurements. Just convo me and let me know what you are interested in and I will do my best to accommodate you. To redeem a gift certificate it is best for you to have an Etsy account. They are free, quick and very good about privacy. Then simply “purchase” the item you desire, checkout, select other payment and write your gift code and any other information in the message to seller section. If you buy more than your gift certificate is for I will send you a revised invoice to your email address to complete your order. If you do not use up your gift certificate I will mark it in my records and you are welcome to use the balance towards a purchase at any future time. If you have any more questions feel free to convo me. I try to leave feedback when I can but it is very time consuming and I've found that many costumers buying these as gifts rather not have feedback. That being said I am happy to leave feedback if it is important to you. If you would like feedback just let me know and I'm happy to leave it after I have shipped the item and confirmed it has been delivered.